1 trout fillet, skin on. Place the trout fillet skin side down on a plate, mix the salt, sugar and spices to together having first chopped the bay leaves and crushed the pepper and juniper. Liberally season the fish with the cure mixture and set aside for 20 mins or so. Rinse the fish and pat dry, slice the flesh into pound coin thick slices leaving behind the skin. Hot smoker and wood shavings. 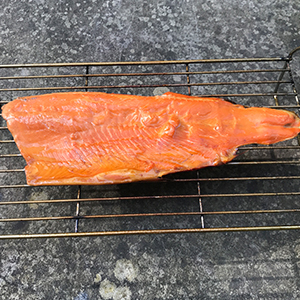 Heavily salt the trout fillet for 15 mins until noticeably firmer. Rinse and pat dry. Season with a little pepper and hot smoke until just cooked.